In this essay, I discuss my video installation Islamic Intertext and consider the notion that documentary can be hijacked by the tactic of détournement. My interest in documentary is part of a wider phenomenon among contemporary video installation artists, who use documentary as a tool to interrogate and subvert generally accepted notions of what counts as reality. 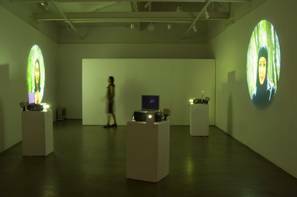 Unlike documentary makers for film or television, video installation artists create documentaries that break through the media spectacle by representing information with a degree of plasticity. Plasticity arises out of changing the context in which the work is shown, transforming the genre by incorporating audience interaction in three-dimensional space. Developments in video technologies and the internet have enabled pervasive non-professional journalistic activity, permitting artists to rupture the spell of the spectacle. Artists who produce works about current events are not creating work for the same industry as journalists, and thus can take more time to contemplate their ideas. Unlike that of journalists, artists' work is not evaluated in accordance with editorial imperatives, so it is less susceptible to being flattened by the media spectacle. Artists producing representations about current events can contemplate their ideas through interactive and innovative means. The inevitable time lapse between a current event and its representation within "the sphere of art makes it possible to resist the levelling and deadening effects of the cultural industry" (Beausse 92). When documentaries are shown as works of art in galleries, they diverge from those created by the media or journalists in various ways. They are not subject to the limitations of the conventional use of content-derived narrative, often based on a particular viewpoint or argument. Instead of using editing to develop a content-derived narrative, sequences are made up of a stream of quotations with repeated images. This contrasts with television or film documentaries which are edited in a linear, logical sequence, designed so that each image or comment is rarely seen more than once during the course of the broadcast. Documentary presented as installation is a form of détournement because it creates a new form by hijacking the conventional media. Debord describes détournement as the use of two separate elements that displace the original, or the re-use of elements of well-known media to create a new work with a different message. Détournement is the French word for deflection, diversion, rerouting, distortion, misuse, misappropriation, hijacking, or otherwise turning aside from the normal course or purpose. A documentary, projected in the context of a sculptural site, replaces a central fixed argument with multiple channels and thus relates interviewees' experiences in a manner that is not limited by editorial imperatives, time constraints or the production requirements present in the conventional form. French art critic Pascal Beausse described the way artists inquire into reality, using the same technologies as the media. He wrote that artists enjoy the "...possibility of playing upon the different regimes of visibility now available in order to offset the numerous drawbacks in the representations of social reality produced by the omnipotent television imagery" (74). Artists create documentaries along the indefinite edges of the genre, not firmly within its borders. Artists hijack documentary by turning the genre into video installation. Documentary created by artists operates intertextually at the malleable edges of the genre. Approaching documentary in multiple-channelled installation alters how the audience interacts with the video, and the amount of video screened, in ways that cannot be achieved in film and television. The experience of viewing documentary in three-dimensional form is exemplified in the following installations. For his installation Küba (2004), Turkish artist Kutlug Ataman interviewed residents in one of Istanbul's ghettos. The ghetto has a large Kurdish population and is generally considered impenetrable. Kutlug's documentary comprised 40 television sets, each broadcasting talking-head interviews with Küba residents, conversing fluently about topics ranging from giving up smoking to scavenging for bread in the garbage. Kutlug's Küba resembles a journalistic television documentary, yet leads to much more. The viewer is not subjugated to narrative or position, but instead traverses the 40 residents' conversational dialogues by interacting with each channel positioned in the space. The work transforms television's journalistic devices into a 40-channel video installation, exhibited in a sorting office on New Oxford Street in London. Significantly, the amount of video footage needed to create Küba could not be broadcast in a film or on television. Freed of time constraints, the installation provides immense detail, enabling the viewer to respond more intensely to the lives of 40 residents. Another artist using documentary in innovative ways is Chilean-born artist Alfredo Jarr. Jarr resituates journalistic images, as demonstrated in The Rwanda Project: 1994-1998. In this work Jarr responds to the complexities involved in exhibiting images of mass death, by showing them not in a news presentation, but via a complex installation spread across different rooms in an art gallery. In one gallery room, a brightly backlit line of texts details Jaar's interview with a survivor of the genocide, a woman who witnessed the death of her sons and husband. Even though Jarr is not a photojournalist, The Rwanda Project: 1994-1998 "shares the conceptual space of photojournalism and documentary film..." (Moore). 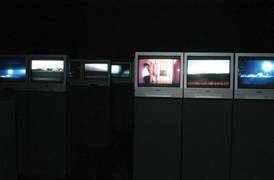 Yet another example of hijacking documentary is an installation by Belgian artist Chantal Akerman. 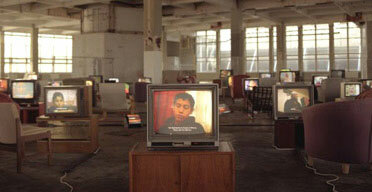 Akerman's Un voix dans le desert (2003) incorporates recycled images from her documentary about the US/Mexico border De l'autre côté (2002). Un voix dans le desert is a three-part installation, showing US border patrol surveillance footage of the freeway entering Los Angeles. Akerman narrates, in both Spanish and English, the story of a female Mexican immigrant who disappeared in Los Angeles. This work is a striking example of a journalistic device taken from a media environment into an art gallery, and reaching the viewer through a fresh multi-channelled installation context. These artists hijack the documentary form explored in news, television and the print media by turning the genre into video installation. Documentaries by artists work intertextually with the genre. As Laurent Jenny observed, concerning the linear unfolding of a text: "Each intertextual reference is the site of an alternative..." (67). Artists' hijacking of documentary intertextually replicates the medium but turns it from its original course or purpose (television and film). "The responses of these everyday people are expressed through a three-channel video installation that uses simplicity, juxtaposition and intertextuality to offer a poignant and painfully honest insight into the feelings and experiences of these people in a post-9/11 world" (22). Projecting interviews on multiple screens enables interaction by individual members of the audience, allocating a space to mediate the generous amount of interview material presented. Exposition of such comprehensive interview material is not as achievable in film or television, due to broadcasting time restraints. My aim in producing Islamic Intertext was to explore and extend Guy Debord's tactic of détournement by 'turning' documentary interviews into a multi-channel video ensemble. The documentary uses talking-head interviews but lacks other conventions found in the genre such as experts, voiceover or narrative structure. Debord and Wolman stressed that "ideas and creations" in the realm of détournement can be "multiplied at will" (207) : that is, détournement cannot be confined to a particular creation or idea, but involves hijacking well-known media into another context. Islamic Intertext can be seen as a moderate illustration of détournement: the original context of documentary is transformed into installation, narrative is recast into looping interviews, and linear images on a single screen are replaced by multiple in curvilinear form. Each screen comprises responses made by the interviewees on a particular topic. The edited sequences operate randomly, mirroring the heterogeneity and intertexutality of the material captured. At a glance, the viewer can observe different interviewees on each large circular screen, engaged in dialogue, responding to questions on one of the topics (jihad, vilification and multiculturalism). Mikhail Iampolski writes about the opportunity for auxiliary meaning through intertextuality: "intertextuality can thus be seen to enrich meaning and to salvage the very linearity of narrative..." (31). My installation is intertextual by nature: Australian multicultural policy is meant to protect citizens' and prevent religious/racial vilification, yet misunderstandings about jihad have stereotyped Australian Muslims, leading to extreme religious/racial vilification and debate about the desirability of the policy itself. Since creating Islamic Intertext in 2006, representations of Muslims have continued to permeate the Australian media. The video installation highlights the experience and impressions of a series of unknown Australian Muslims concerning jihad, vilification and multiculturalism. Paul Ardenne, in his essay Experimenting with the Real, described 'experience' as referring to "the process of broadening and enriching the knowledge resulting from it" (12). Islamic Intertext reworks and relocates the viewer's experience of documentary. In experimenting with documentary, I incorporated video as a tool to interrogate generally accepted notions of reality, enabling audience interactivity in a three-dimensional environment, to explore the experiences of 67 unknown Australian Muslims. I met my first interviewee, Sara, at an exhibition by an Iranian artist, Hossein Valamanesh. It took place in a small dark room with an electronic Sufi-inspired sculpture, The Lover Circles his own Heart (1993). Sara opened doors for me into the Islamic community, paving the way for the 67 interviews I eventually conducted — mainly in Canberra, but also in Sydney, Perth, Adelaide and Toronto, Canada. Members of the community generously allowed me to conduct hour-long video interviews with the respondents, who originally came from one of the following 28 countries: Afghanistan, Australia, Bangladesh, Canada, China, Egypt, Fiji, Germany, India, Indonesia, Iran, Iraq, Jordan, Lebanon, Libya, Malaysia, Maldives, Morocco, Pakistan, Palestine, Saudi Arabia, Singapore, South Africa, Switzerland, Syria, Tunisia, Turkey and Vietnam. 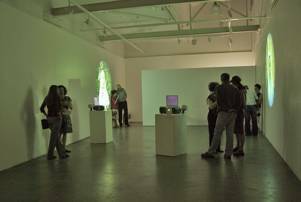 Islamic Intertext was exhibited at the Canberra Contemporary Art Space, and at ANCA gallery in 2006. A section was exhibited in the Garden of Earthly Delights at the National Museum of Australia in 2006, as part of The Cultural Studies Association of Australasia Annual Conference, UnAustralia. Video was also presented at a conference held at the University of Technology Sydney, Not Another Hijab Row, in 2006. This work was also shown at McGill University in Montreal, for a paper I presented in the CTRL conference in 2004. Kutlug Ataman Küba(2004) Sorting Office, London. Chantal Akerman, De l'autre côté (2002). Intertextuality, a concept introduced to Western critics by the theorist Julia Kristeva, communicates the idea that every text exists in relation to other texts, and makes its meaning not in response to reality, but to other discourses. Kristeva writes that: 'Each word (text) is an intersection of words (texts) where at least one word (text) can be read' (Kristeva 1980: 66). Kristeva came up with the term intertextuality from her translation of Mikhail Bakhtin's notion of dialogism: the notion Bakhtin draws from the Socratic dialogues 'that every text forms an intersection of textual surfaces' (Stam et al. 1992: 204). Islamic Intertext (2006) ANCA gallery, Australia. The text Mode d'emploi du détournement was first published in French in May 1956 in the journal Les Lèuves Nues and translated to English as User Guide to Détournement. Ardenne, Paul. "Experimenting with the Real: Art and reality at the end of the twentieth century." Contemporary Practices: Art as Experience, Paris, Éditions Dis Voir, 1999: 12. Beausse, Pascal. "Informations: Inquires into the Real and the Self-Media." Contemporary Practices: Art as Experience. Paris, Éditions Dis Voir, 1999: 74: 92. Debord, Guy, and Wolman, Gil. "A User's Guide to Détournement" Guy Debord Complete Cinematic Works: Scripts, Stills, Documents. Oakland, AK Press, 2003: 209. Iampolski, Mikhail. The Memory of Tiresias, Berkeley and Los Angeles, University of California Press, 1998: 31. Jenny, Laurent. La Stratégie de la forme. Poétique 27, (n° special consacré à notion d'intertextualité), 1976: 67. Kristeva, Julia. Desire in Language: A Semiotic Approach to Literature and Art, New York, Columbia University Press, 1980: 66. Moore, Alan. Alfredo Jaar's Rwanda Project. ArtNet, 1998. Stam, Robert, et al. New Vocabularies in Film Semiotics: Structuralism, post-structuralism and beyond, London, Routledge, 1992: 204. Treadgold, John. Look Into Muslim Mind. The Canberra Times. Canberra, 2006: 22. Islamic Intertext (2006) Canberra Contemporary Art Space. Kutlug Ataman Küba (2004) Sorting Office, London. OnacloV is an installation artist. 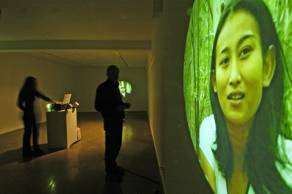 Her PhD examined how the genre of documentary transforms in video installation via the processes of intertextuality and détournement. She has a degree in Visual Art (Honours) from the Australian National University and L'École National Supérieure des Beaux-Arts Paris, as well as a post-graduate Diploma from L'École Supérieure des Beaux-Arts Marseille, France. OnacloV has exhibited her work internationally in France at the ENSBA gallery in Paris 1997 and Marseille 1999; in the USA at the Commencement Art Gallery 2000; in Canada at McGill University 2004; in Australia at the National Gallery of Australia in 2005; The Canberra Contemporary Art Space in 1999 and 2006; M16 2006 and the University of Technology gallery in 2006.